Roddy McMillan (23 March 1923 – 9 July 1979) was a Scottish actor and playwright, possibly most famous for his comedy role as Para Handy for BBC Scotland's television series, The Vital Spark . He also played the lead role in Edward Boyd's private eye series, The View from Daniel Pike . Para Handy, the anglicised Gaelic nickname of the fictional character Peter Macfarlane, is a character created by the journalist and writer Neil Munro in a series of stories published in the Glasgow Evening News between 1905 and 1923 under the pen name of Hugh Foulis. The Vital Spark was a BBC Scotland television series set in the western isles of Scotland in the 1930s, based on the Para Handy books by Neil Munro. It starred Roddy McMillan as Peter "Para Handy" MacFarlane, captain of the puffer Vital Spark. The Glasgow Unity Theatre was a theatre group that was formed in 1941, in Glasgow. The Unity theatre movement developed from workers' drama groups in the 1930s, seeing itself as using theatre to highlight the issues of the working class being produced by and for working-class audiences. The movement had strong links with the Communist Party of Great Britain and the Left Book Club Theatre Guild. He also performed in his own play, The Bevellers, which achieved success in performance at the Citizens Theatre in Glasgow during 1973 and then as a televised Play for Today for BBC. McMillan also played Detective Inspector "Choc" Minty in the late 1970s private eye series, Hazell , starring Nicholas Ball. The Citizens Theatre, in what was the Royal Princess's Theatre, is the creation of James Bridie and is based in Glasgow, Scotland as a principal producing theatre. The theatre includes a 500-seat Main Auditorium, and two studio theatres, the Circle Studio and the Stalls Studio. Play for Today is a British television anthology drama series, produced by the BBC and transmitted on BBC1 from 1970 to 1984. During the run, more than three hundred programmes, featuring original television plays, and adaptations of stage plays and novels, were transmitted. The individual episodes were between fifty and a hundred minutes in duration. A handful of these plays, including Rumpole of the Bailey and The Blackstuff, subsequently became television series in their own right. Hazell is a British television series that ran from 1978–1979, about a fictional private detective named James Hazell. Roderick Andrew Anthony Jude McDowall was an English-American actor, voice artist, film director and photographer. He is best known for portraying Cornelius and Caesar in the original Planet of the Apes film series, as well as Galen in the spin-off television series. He began his acting career as a child in England, and then in the United States, in How Green Was My Valley (1941), My Friend Flicka (1943) and Lassie Come Home (1943). William Fulton Beith Mackay was a Scottish actor and playwright, best known for his role as prison officer Mr. Mackay in the 1970s television sitcom Porridge. The Vital Spark is a fictional Clyde puffer, created by Scottish writer Neil Munro. As its captain, the redoubtable Para Handy, often says: "the smertest boat in the coastin' tred". Stanley Baxter is an award-winning Scottish actor and impressionist, known for his popular British television comedy shows The Stanley Baxter Show, Baxter On..., Time For Baxter, The Stanley Baxter Picture Show, The Stanley Baxter Series and Mr Majeika. Bill Paterson is a Scottish actor and commentator, best known for playing the lead role in the BBC One paranormal, mystery drama Sea of Souls between 2004 and 2007. He also played the lead in the Bill Forsyth movie Comfort and Joy in 1984. In 2010, he appeared in the Doctor Who episode "Victory of the Daleks". Russell Hunter was a popular Scottish television, stage and film actor. 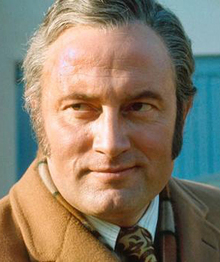 He is perhaps best known as the character "Lonely" in the TV thriller series Callan, starring Edward Woodward; and that of Shop-Steward Harry in the Yorkshire Television sitcom The Gaffer. Iain Cuthbertson was a Scottish character actor. He was known for his tall imposing build and also his distinctive "gravelly" heavily accented voice. Michael John Elphick was an English actor known in the UK for his trademark croaky voice and his work on British television, particularly his roles as the eponymous private investigator in the ITV series Boon and later Harry Slater in BBC's EastEnders. He was nominated for a BAFTA Award for Best Supporting Actor for his performance in Gorky Park. Tony Curran is a Scottish actor who has appeared in Underworld: Evolution, Doctor Who, Roots and the Netflix historical epic Outlaw King. David Hayman is a Scottish film, television and stage actor and director, known for his role as DCS Mike Walker in ITV drama Trial & Retribution, as Jonas Franks in BBC period drama The Paradise and as Brace in the drama Taboo. Archie Duncan was a Scottish actor born in Glasgow. Edward Boyd was a Scottish writer best known for his television and radio work. 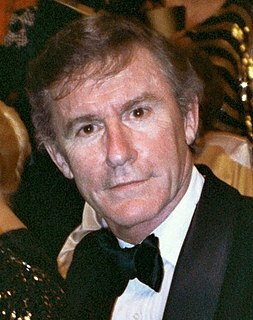 David Ashton is a Scottish actor and writer. Trained at the Central School of Speech and Drama in London, 1964–67, he has acted in a wide variety of film, television, theatre and radio roles. He has also developed a parallel career as a writer of fiction, film and television screenplays and plays for theatre and radio. His radio play The Old Ladies at the Zoo, which starred Peggy Mount and Liz Smith, won the Radio Times Drama Award in 1985. Richard Madden is a Scottish actor and producer. Born and raised near Glasgow, in Renfrewshire, he made his screen debut as a child actor and stage debut whilst a student at the Royal Scottish Academy of Music and Drama. In 2007, he toured with Shakespeare's Globe company as Romeo in Romeo and Juliet, a role he would reprise in the West End in 2016. This is a list of events in Scottish television from 1979. Maev Alexander, also Maeve Alexander is a Scottish television and stage actress. Aside from her numerous stage appearances including Cleopatra and in The Mousetrap at the St Martin's Theatre in London, she is perhaps best known for playing the assistant Christine Russell in the early 1970s Scottish TV series Sutherland's Law, as Janet Campbell in the 18th century set The New Road, and as WPC Sandra Williams in the British police drama The Gentle Touch (1981-2). She is married to Simon Dunmore, a notable theatre director and author on acting. Jamie Quinn is a Scottish actor and musician. He is best known for his roles as Private Kevin "Mac" McDowell in Bluestone 42, Fergie in Still Game and Ian Baird in Two Doors Down. ↑ "STA Catalogue: Roddy McMillan". University of Glasgow Special Collections. Retrieved 14 June 2009. ↑ "'Tough guy' TV actor dies at 56". The Guardian. 10 July 1979.